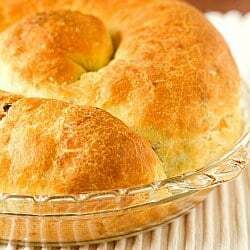 Yesterday I shared with you a traditional Italian Easter Bread recipe from my Chief Culinary Consultant’s family; today I share with you my grandma’s famous bacon and cheese Easter bread. Growing up, this was by far my favorite Easter recipe in our family. (It should come as no surprise that I love the combination of bacon and cheese nearly as much as peanut butter and chocolate.) Between this and her pigues, I think I sustained myself with dough, cheese, and bacon for the entire week of Easter. A pretty delicious week, no doubt. My grandma always referred to this as “bacon and cheese Easter pizza” and I have seen it mentioned that way in a few other places as well, but I couldn’t find any background regarding the name. All I know is that swirls and swirls of bacon and cheese packed into a light, tender dough is pretty much my savory heaven. My mom always jokes that my grandma’s knack for baking skipped a generation to me, and the more that I work my way through her recipes, the more I realize how similar our tastes are. We are definitely kitchen soul sisters, my grandma and I. This is a fairly simple bread to bake up, as it only requires one rise and the dough is very forgiving. Once the dough is mixed together (you can do it by hand or with a mixer), you roll it out very thin, into a large rectangle, then sprinkle it with copious amounts of Romano cheese and bacon. I chose to use peppered bacon because I always feel like sharp cheese flavors and bacon pair well with pepper, but you can certainly use regular bacon, my grandma always did. 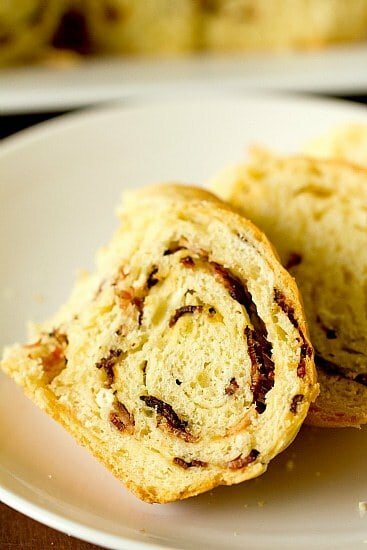 Once you have the cheese and bacon in place, you roll it up jelly roll-style into a thick log. I never knew this, but my mom told me that my grandma always baked these loaves in pie plates, which helped them keep their round, spiral shape. Genius! You very gently coil the roll of dough into a pie plate and let it raise until about doubled in size. Then all that’s left is to bake and eat! First, there are no directions. They are not located on the back of the card – they don’t exist. I think most ladies back in the day just knew how to do things like make bread, so you didn’t need instructions for doing so, you just needed ingredients for different variations. 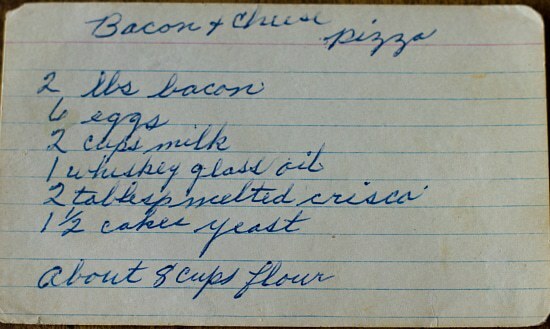 Second, this is a recipe for “Bacon + Cheese Pizza”. Do you see an ingredient listing for cheese? One of the two primary ingredients? Nope. I asked my mom earlier this week why it was missing and how much was needed. She said it was because my grandma never measured the cheese, she just sprinkled it on the dough until she felt like there was enough. When my mom got to sample the bread, she said that the house smelled just like my grandma’s house used to smell the week of Easter, and that the bread tasted exactly like hers. That’s the best compliment I could ever receive. To be able to recreate something of my grandma’s, that I’ve loved since I was a little girl, is a great feeling. And I know she would love that I am sharing her recipe with all of you. I hope you enjoy this little pillow of bacon and cheese heaven as much as I do! 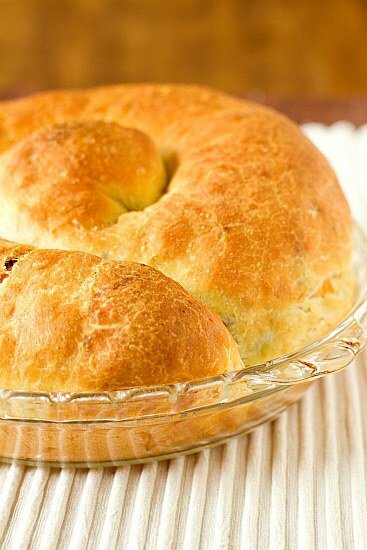 A delicious bread recipe full of good stuff! Place the flour in a large mixing bowl; set aside. Heat the milk in a small saucepan over low heat, stirring occasionally, until it is warm to the touch, but not hot. If you have an instant-read thermometer, the temperature of the milk should be between 110 and 115 degrees F. Once the milk reaches the correct temperature, remove from the heat, add the yeast, stir, and let sit for 10 minutes. Add the milk and yeast mixture to the flour and begin to mix it into a dough (it will be shaggy at this point). Next, add the vegetable oil and melted shortening and continue to mix. Now, add the eggs and continue mixing until the dough forms a rough ball. Turn the dough out onto a floured surface and knead it, adding more flour as necessary, until it is smooth and elastic, about 5 minutes. Divide the dough into two and cover one half with a dish towel while you work with the other. 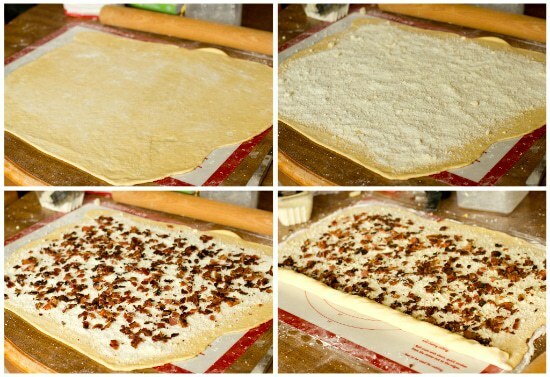 Working with one piece of dough at a time, roll it out very thin, into a large rectangle about 12x24-inches. Sprinkle the dough with half of the cheese, and then with half of the bacon, leaving a half inch border around all of the edges. Starting with a long end facing you, roll the dough up into a tight cylinder jelly roll-style, pinching the seams and ends to seal. Once you have finished rolling the dough, gently coil it into a spiral into a pie plate. Repeat with the second piece of dough. Once both loaves have been shaped and placed into pie plates, brush them with melted butter and then cover loosely with plastic wrap. Place in a draft-free area and allow to rise until almost doubled in size, 1 to 2 hours, depending on the temperature and humidity. Preheat the oven to 350 degrees F. Bake the bread until golden brown on top, about 35 to 40 minutes. 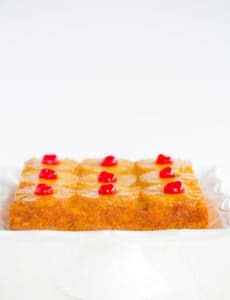 Allow to cool to warm room temperature before slicing them (ideally, let them cool completely, but sometimes I just can't wait!). 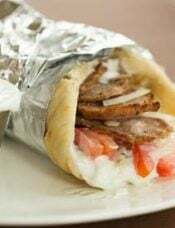 Leftovers should be wrapped in plastic wrap and can be kept at room temperature for up to 5 days. The bread can also be frozen - be sure sure to wrap it tightly in plastic wrap, and then in aluminum foil. I love looking through my grandmothers hand written recipes also. The last three years of her life I had the privilege of staying with her during the day while my mother was at work. My grandmother had moved in with my parents at this point against her wishes. She and I always fixed something for my parents to eat for lunch and I learned so much from her in the kitchen during that time. We were always arguing about something and she would say “you just don’t know anything” when it came to cooking. She was making a pie one day and was telling me that you have your basic custard, then you add coco for chocolate pie or coconut for coconut pie, etc.. I asked her how she learned that. She looked a time em and said again that I just didn’t know anything. I said grandmama now I do know you were not born just knowing how to make custard. You talking about how your grandma wrote the recipe without directions made me think of the day we had the discussion about custard. This bread sounds so good and I am going to try it for sure. Sorry I wrote a novel as a comment. Do you think I can add extra butter in place of shortening? I never have that. Hi Lisa, I think you could without an issue. I, too, love my grandmother’s hand written recipes. One family favorite is her Hershey Bar pound cake. One of the ingredients she has on there is ‘six 10 cent Hershey bars’. Lol – shows just how old that recipe is. Hi Clio, Thanks so much for sharing the different variations – I am definitely going to try them! I’m a culinary student and in class we do this competition called bread wars. We all had to find a recipe and make 6 loaves to be judged and voted on. So I decided I would make this recipe and ended up winning 2nd place! I really love this recipe the only things I changed was I used bacon fat instead of melted shortening. Also I shaped my bread in a little different way. Thanks for the great recipe! Hi Lily, It is important, as it’s a form of fat. Vegetable shortening is also known as Crisco, perhaps that would help. It’s sold in pretty much all grocery stores. If you don’t use it, you’ll need to replace it with either more vegetable oil or melted butter. Enjoy! I made this recipe last year – I brought one loaf to our church’s Easter Breakfast and one for visiting at my Mum’s. It tasted great and everyone loved it! This year, I was thinking of making your Morning Buns, but when I saw the amount of butter involved – and I realized that I’d have to double the recipe to feed the 6 people in my family – 5 of whom are hungry boys and men, I changed my mind. So I made this bread again, but once it was rolled into a “log”, cut the log into slices and (after they rose) baked them in paper-lined muffin cups – just like your morning bun recipe requires. They were absolutely gorgeous, totally delicious, and completely satisfying. Thanks for the wonderful recipe! I used White whole Wheat flour, and the bread was tender and yummy! Even 1 package of bacon is a splurge for our grocery budget, so there’s no way I could afford to use three packages for what was basically one breakfast. While I’m sure this would be amazing using 3 packages of bacon, I used one and still had nothing but compliments. We don’t celebrate Easter so there’s no good reason to wait to make this:) I served it along with tomato soup for dinner. What a great dinner! I love what you said about the women back in the day having no directions, my Grandmother was born in Palermo Italy and her receipes for the Italian Butter cookies were like a bunch and a pinch of whatever…I am 62 and you are so unusual for a girl of your age to even cook…the young generation your age, has no clue what is like to prepare a homemade meal nor do they care. 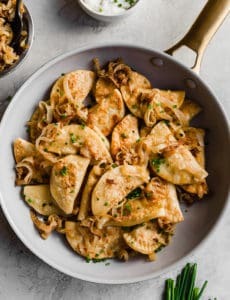 My husband could not believe you are like you are for your age, and he is from Pennsylvania Italian Family where the grandmothers would sit in a room and make homemade Ravioli, but his sister no way Cooking a waster of time first thing you do when you get married you call take out and use TV dinners… My husband is shocked at your cooking for your age. Maybe its how your were raised. Thank you for sharing a beautiful story of your love for your Grandmother! I just came across this today while looking for your pumpkin muffin recipe. Did we have the same Grandma? My grandmother’s recipes were written just like this. Even looks like the same handwriting! And the raisin cookies and chipped ham BBQ are foods she always used to make too. I have been looking for the raisin cookie recipe for years. She called them Hermits but I never could find it in her recipes after she died. Thank you so much! I can’t wait to try them. This looks amazing. I’m looking at our calendar/plans and I think to make it for next Easter. Thanks! 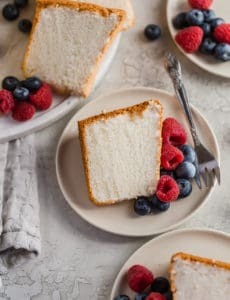 made this for Easter Brunch and it was a hit! i subbed in whole wheat flour for 1/4 of the flour, which i probably won’t do again.. it made the bread a little crumbly. for those asking about the cheese: at first, i completely messed up and started shredding cheddar & jack cheese all over the dough.. i realized my error, took most of that cheese off, and added grated parmesan instead. the little bits of shredded cheese that were left did no harm at all. in fact, they were like little cheesy surprises in the bread! Is it possible to make the dough and then refrigerate it overnight until you’re ready to bake it? I’ve done this with other bread recipes but wasn’t sure if it was possible with this particular recipe. I LOVE your blog by the way!!! I made the peanut butter eggs this weekend and the Easter sugar cookies with royal icing…YUM! Hi Laura, I don’t think that it would work as well with this recipe since it only goes through one rise. You could try assembling the bread, but instead of letting it rise at room temperature and then baking, you could place it in the refrigerator for a longer, slower raise and then bake in the morning. I’ve never done it, but I think that should work. Just be sure you have it covered in plastic wrap so that cold air doesn’t get in and dry out the dough. Thank you for sharing the recipe, and the story of your grandmother. She sounds like a very special lady. I love the whiskey glass measurement of oil, but even more I love the reference to Crisco. That must be a Pittsburgh thing. I have recipes from my mom from some of her older acquaintances that would have been your grandmother’s age, if not older, whose handwritten recipes are so precious to me now. References to Crisco, oleo, and lekvar immediately transport me back to my childhood and simpler, carefree times. Enjoy your holiday. I will be making this for my family soon. They have never met anything with bacon they didn’t like. I will be sure to find a “whiskey glass” to measure the oil too. I hope that would make your grandma smile. 1 whiskey glass of oil – those are my kind of recipes :) and exactly the same type of measuring i find in my grandmother’s recipes, too! This looks like a great bread and I can’t wait to try making it. But what really sold me on it was your grandmother’s whiskey glass of oil. 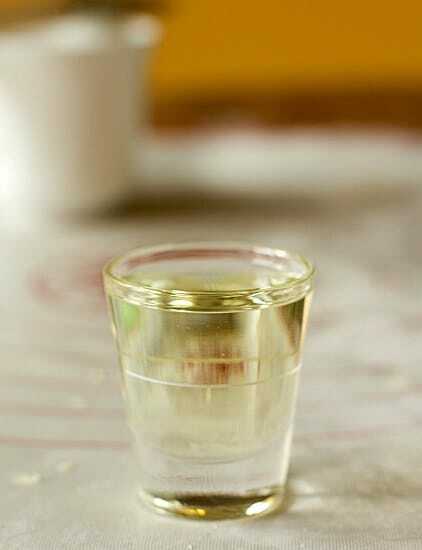 Many of my grandmother’s recipes call for a juiceglass of oil or juice, or some fraction there of. My grandma has been gone for 15 years now, but my folks still have 2 of those juice glasses left, and I treasure them both. I don’t think she even owned a measuring cup! And whenever I would ask for any amount of something for a recipe, she always replied “Add enough, stir enough, cook or bake enough until it looks, feels or tastes done”. I think Grandma would be happy to know this is how I cook to this very day! I love this post, and yesterday’s. I love hearing the stories about family recipes, and the pictures of the recipe cards are beautiful! I have many of my great-grandma’s recipe cards and hers are the same. Mostly lists of ingredients, sometimes an oven temperature. I’m going to try the orange-anise bread! 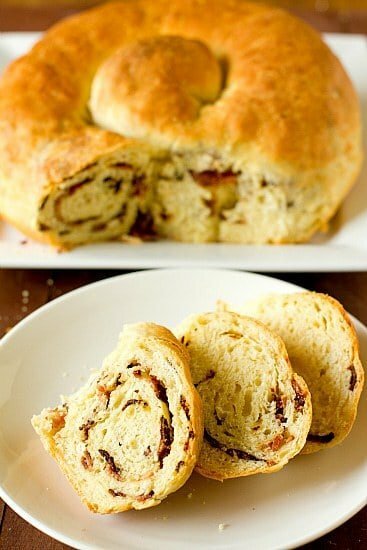 This looks amazing, have to make it for Easter! My mother passed away a few years ago and I’ve been going through her old recipe box and it’s amazing that the recipes are similar to your grandmother’s recipes when writing them down. I remember a lot of the recipes so I am able to figure them out, probably should write down the amended version for my daughter. I was wondering, if I make this bread the night before, would it be just as good and could I reheat it. Thanks Michelle and have a great Easter Holiday! This bread is beautiful. It sounds delicious. Don’t you just love baking up family recipes. It makes you feel good inside. Thanks for sharing. This looks GREAT! I won’t be able to make it for Easter but you can bet next week I will. Thanks for this post!